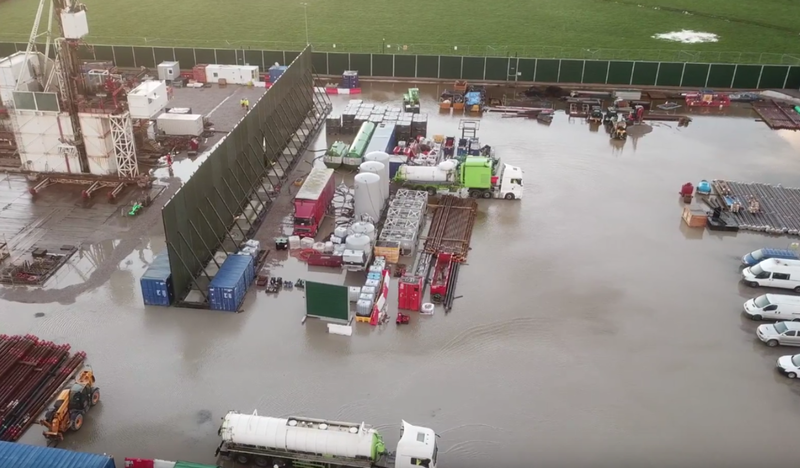 Here we go: Cuadrilla have completed their first well at the new Lancashire site and will shortly be ready to frack: and not before time - it's been nearly 7 years since their first attempt. The antis are limbering up for 13 weeks of colourful protests, so it should all be very jolly. What slightly troubles me is that Cuadrilla are a pretty useless crew (ditto Third Energy). They have made a pig's ear of the drill pad up in Lancs, allowing it to flood everywhere and breaching their permits several times. (That's water in the pic, not ultra-smooth concrete - and it's never been entirely clear where it came from, though Cuadrilla says rain.) Given that handling immense quantities of liquids is what the fracking game is all about - both in the pumping-down phase of the operation, and perhaps more significantly in the flow-back phase when a substantial proportion of the fluids that've been sent down come back up again, often heavily polluted - it doesn't bode well that these jokers can't even handle suface water. Who knew it rained in Lancashire, eh? Bloody amateurs. Still, the big boys were always reckoning to let the minnows take the flak, then move in once the reserves have been proven. A good long-term strategy? If it allows the game to be brought into terminal disrepute, I'm not so sure. At the moment most common folk seem more interested in banning plastic straws or paper cups, because polar bears might eat them or something. "Yes, Mr Wright, that's all very well, but you're scaring the birds, they're dying in their millions. You seem also to be triggering hurricanes. And it's unnatural. I'm afraid we'll have to do what we've done to automotive vehicles. Ban them until they are safer." To be honest, I am not all that surprised that their site in Lancashire is flooding, since it is on a particularly flat area of reclaimed wetland. It is also probably not close to any big sewers, so they'll have to treat any contaminated water on-site before pumping it off-site. They also have the problem of an encampment of crusty protesters outside their gates. The flood pictured looks only an inch or so deep; they may actually view this sort of flooding as a good thing, since it makes any sit-down protests on their site a soggy and thoroughly miserable prospect (especially if the protesters are ignored completely for an hour or two; that pisses them off and gives 'em time to catch their death of cold sitting in cold floodwater). after which it slops over the perimeter! Needless to say Cuadrilla is applying for permission to discharge into the surroundings. They will need to treat the water beforehand - of course: and we believe them. Protesters don't get inside. They aren't really trying, IMHO. They fly some good drone, though. It may be the govt. attitude to wait and see what it can get going, but this is exactly the approach that has made people realise what a bunch of amateurs charlatans, shysters and fantasists have inhabit the Tory Govt. efforts to push fracking since Cameron's time. Btw many of those opposed are natural Tories, rather that the "Greens" often suggested in the more spittle flecked comments around these parts. Next we saw liars and fraudsters such as Chris Faulkner promoted by the Govt. as fracking cheerleaders. Finally the understanding that shale in the UK being the realm of fantasists and the delusional. And that is before we get onto re-writing planning laws to strong arm the situation to subvert local democracy and the use of police as private security firms for the utter incompetents Cuadrilla, INEOS, UKOG, the list goes on. And still it doesn't work..